The Nun Evphrosynia, in the world Evdokia, was the daughter of the Suzdal' prince Dimitrii Konstantovich (+ 1383), and from 1367 was the spouse of the Moscow GreatPrince Dimitrii Donskoi. Their happy union was for Russia a pledge of union and peace between Moscow and Suzdal'. Great influence was had upon the spiritual life of the princess Evdokia by Sainted Alexei, Metropolitan of Moscow, and even by the Monk Sergei of Radonezh, who baptised one of the sons of Dimitrii and Evdokia. the godfather of another was the Monk Dimitrii of Prilutsk. The holy princess was a builder of churches. In 1387 she founded in the Moscow Kremlin the Ascension women's-monastery. In 1395, – during the time of the invasion of Tamerlane into the southern regions of Russia, upon her advice the Vladimir Icon of the Mother of God was transferred to Moscow, miraculously defending the Russian land. In secret as an ascetic deed during Lent, the princess wore chains beneathe her splendid royal clothes. By her patronage was written the famous image of the Archangel Michael, set afterwards as the temple patron-saint icon of the Kremlin Archangel Cathedral. Having raised five sons (a sixth died in infancy), the princess took monastic vows with the name Evphrosynia. 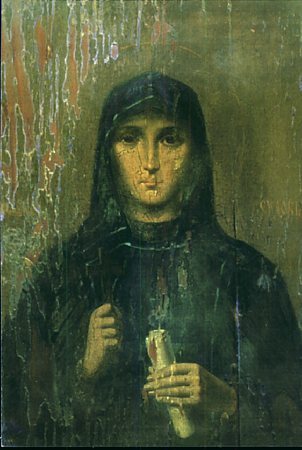 Having completed her earthly journey in prayer and ascetic deeds, Saint Evdokia peacefully reposed on 7 July 1407 and was buried in the Ascension monastery founded by her. An emotionally imbued memorial of old-Russian church poetry is known of, expounding the lament of the princess for her husband, who had died at age 39.